The Knights of Columbus Council No. 8851 of Orangeville, Ontario, Canada are pleased to announce that we will be hosting our 10th annual 2018 Sunshine Charity Poker Ride & Silent Auction supporting local charities and causes. What is the Sunshine Charity Poker Ride? The 2018 Motorcycle Charity Poker Ride & Silent Auction is an annual event held on the 2nd Sunday in September by our Council. The purpose of this event is to hold a fun filled, community event to raise not only awareness about but also raise funds to support the local charities and causes we help. The Poker Ride starts at 8:30 AM on Sunday September 9th, 2018 at the Orangeville Curling Club (76 5th Avenue, Orangeville, ON). The Ride consists of a scenic route that is approximately 200 kilometres in length. 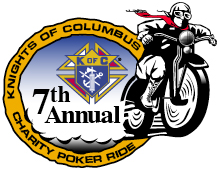 The Poker Ride finishes at 3:00 PM sharp at the the same starting location where refreshments will be served. Draws for prizes (such as the raffle for a new bicycle) will also take place at the end of the ride. - $125.00 prize to the rider with the highest paid pledges over $100.00. Why are you hosting the ride this year? This year we are pleased to be hosting our ride in support of the Coogan Family and especially their beautiful daughter, Ashyln. Funds raised also support other individuals/families and groups throughout our community. 2. Pay the $25.00 registration fee for each person wishing to be eligible for the $1000.00 winning hand prize. Are you accepting corporate or private donations? YES! The Knights of Columbus are extremely appreciative of the Corporate and Private (Family) donations that have and continue to support us each year. We also welcome any new businesses and families who are willing to provide financial support to this fundraising event. For more information, please contact any member of our Council or contact us. Please note that tax receipts are issued for those business or individuals who request them and have contributed at least $20.00 in donations. We would like to show our appreciation and thanks once again to Scotiabank who has agreed to be a major sponsor for our event year. We would also like to thank Zehrs Orangeville for agreeing to supply the food and beverages yet again. Any and everyone can help us whether you are a motorcycle rider or not. If you are a motorcycle enthusiast, please plan on attending our event and bring out as your fellow motorcycle enthusiasts as you can. If you don't ride, still come out to the event and join in this community event and participate in some of the draws. Pass the word about this event to family, friends, neighbours and co-workers by forwarding this website link to those you think may be interested, by getting permission to post our flyer at your place of employment, and by sharing this event on your social networks. Please also feel free to make a donation or sponsor someone riding in the event. Our Council has hosted this event for the past eight years initially to help support the Bolton Family and especially their daughter Kaitlin Bolton through the Kaitlin Bolton Sunshine Fund along with other local causes and charities. In 2012, it was with great sadness that we had to announce the passing of our little angel, Kaitlin, who tremendously inspired and impacted our Council. Since our first Charity Ride was held in September 2009, we have been able to raise approximately $200,000.00 through our eight previous rides thanks to the generous support of our corporate and private sponsors, the participants and our local community. Additional information is available from media stories about our past events. Please click one of the links below. We appreciate and thank everyone who has participated and supported us over the last four years. We look forward to seeing you out again this year. Together we do make a difference in our community!